There is more FUN in numbers! Experience opportunities for Fun Golf Activities throughout the month. Join us for our Par-3 Challenge inspired by the Major PGA TOUR Events that take place the Friday of the PGA TOUR event at 5PM or make it out for our Monthly Invitationals that take place one Sunday a month at 2PM. Call for more details. Join us at ¡CUATRO every Wednesday from 5:00pm-9:00pm. Enjoy 50% off select bottles of wine. Our Golf Instructors will transform your golf game with the cutting-edge technology of the V1 video system. TPC Tampa Bay is one of the most beautiful and exciting courses in Florida. 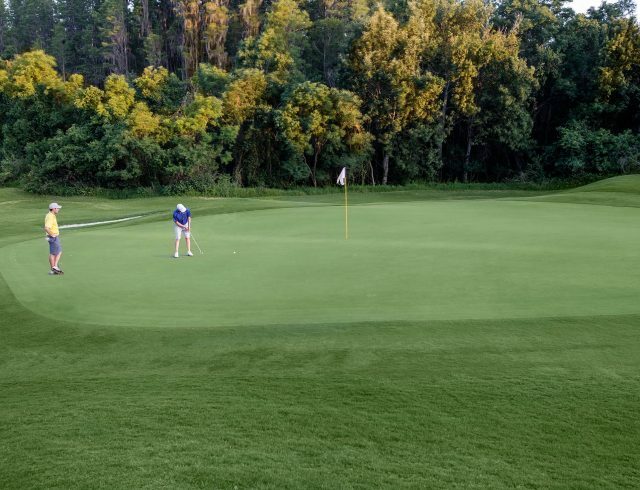 Built by the PGA TOUR in 1991, the Bobby Weed designed 18-hole resort course has earned a 4 ½ star rating from Golf Digest and was named one of the top five golf courses in Florida by Florida Golf Magazine. Home of 21 consecutive Champions Tour events, the stunning course winds through natural wetlands, cypress heads and lagoons, providing the perfect backdrop for outstanding golf. The natural setting and abundance of wildlife are why TPC Tampa Bay is one of only two courses in the Tampa Bay area to be designated as an Audubon Cooperative Sanctuary. Aside from the wildlife, the masterfully designed course is meant to challenge the top golfers of the world, but also to provide a challenging and fun experience for players of all abilities.